When it comes to pro tecting stone flooring surfaces, there are commonly two ways it is done - with topical sealants or impregnators. Both products have their advantages and disadvantages. Topical sealants can be relatively cheap and easy to apply. The prod uct provides a superficial layer on the flooring surface, which with stands most of the traffic wear on the stone. “Topical coatings are commonly made of acrylic, polyurethane, epoxy or wax and are not breath able. They change the look and wet- slip frictional properties of the sur face and they deteriorate under sunlight and traffic,” says Stuart Anderson from Dry-Treat. Some topical sealants provide a shiny or matte look, and Anderson says there is no substitute for a top ical coating in certain industrial applications and graffiti protection. There are several disadvantages of topical sealants, though. Surfaces which have been treated with a topical sealant need to be regularly buffed and the coating needs to be reapplied as it typically shows scuffs and scratches soon after it has been applied. The con stant reapplication can build up on the surface and cause an unsightly appearance, such as a glossy, plas tic look on stone surfaces. Poor quality topical sealers can also turn yellow. If the flooring surface is exposed to ultraviolet (UV) light, the stone surface can also be discoloured. When topical sealants are reap plied, the existing coating must be thoroughly stripped back, which can lead to damage to the flooring sur face from using harsh chemicals and abrasives to strip the surface. Although impregnators can be more expensive, surfaces treated with the product will not need this type of constant reapplication. The appearance of the flooring surface also does not change. Impregnators penetrate below the surface of the grout, tile or stone to form a barrier against the penetration of oil and water- based stains while allowing the surface to breathe. A good quality impregnator can repel water, water-borne salts and oil. “This gives protection from weath ering, cleaning, traffic, freeze-thaw … and efflorescence. Some impreg nators are also designed to give a colour enrichment or wet look without changing the slip resist ance of the surface,” Anderson says. Impregnators typically react in the air to form a thin film on or just below the surface. This changes the surface’s absorption characteristics so water and oils are no longer drawn into the sur face but repelled instead. “Better quality impregnators will also penetrate deep inside the capil lary pores where they are protected from weathering and traffic. They can be used on any porous mineral building material, including natural stone, tile, masonry, concrete and grout,” Anderson says. Because they penetrate the sur face, products coated with impreg nators are not affected by UV light. Impregnators are typically water- based or solvent-based. However, Sure Seal Sealants Australia’s prod ucts do not contain either as it uses flurochemical technology instead. “While the technology has expanded greatly in the area of sili cones/siloxane and acrylic materials for architectural coatings over the past decade, there are still problems remaining with the application,” says Arlene Doidge from Sure Seal Sealants Australia. For example, once impregnators have been applied, any excess prod uct needs to be wiped off from the surface to prevent puddling, which can cause a film which is difficult to remove. Some can also yellow on the surface or darken the appear ance of the tile or stone. When treating surfaces with impregnators, the surface must be dry before application. If water gets caught under the surface of the tile or stone, it will eventually move to the surface of the tile/stone and grout. “A good impregnator lets the sur face breathe, whether it is silicone/acrylic-based or not. If a stone can't breathe, not only can you get trapped water but you can also get a breakdown of the underly ing substrate as well,” Doidge says. Some varieties of solvent-based impregnators can be harmful to the environment and release volatile organic compounds (VOCs), so it is advisable to read the material safety data sheet of the product prior to using it. Some impregnators are also enhancers or provide a gloss coat ing, which can have disadvantages. 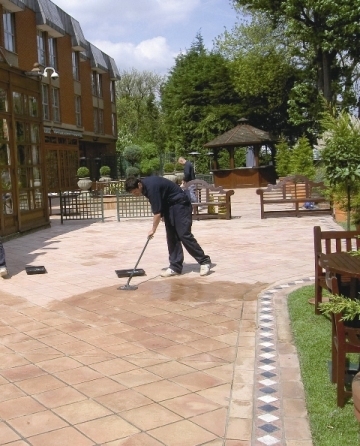 Although enhancers can enrich the colour of the tile or stone, some can prevent the surface from breathing and can peel or flake off over time. They can also be very difficult to remove once they are applied and cured. Anderson says anecdotal evi dence suggests the use of topical sealers on trafficable surfaces around the home and in public spaces is on the decline. “Generally, customers are demanding products that will not make the surface more slippery when wet, and are long-lasting and do not change the natural look of the surface,” he says. When specifying a sealant for flooring surfaces, Anderson advises architects and builders to take the time to compare products with reg ulations and standards.